For visitor's information, go to Hampton-Lighthouse-Historical-Society on Facebook. A white square "pepperpot" tower with a red lantern, standing above the cove. Retains its 6th order dioptric lens. John Titus had the contract to build the Hampton Lighthouse. It was built November, 1911 by Joseph Marshall on a parcel of land bought from Lloyd Brooks. When it was built it had a kerosene lamp that had to be lit each night at sunset and extinguished at daylight. The lightkeeper lived in his house in the village. Supplies, such as oil about five or six 45 gal. drums, brooms, rags, mops, paint, pails, soaps, etc. were brought by ship once a year, usually in June by the buoy boat "Dollard". She would heave to about a mile offshore then a large tender or walk boat with about 20 sailors, mostly French, would bring the supplies ashore. If it was low tide they would land on the beach, offload the oil drums onto planks and roll them all the way up the hill to the lighthouse. If it were high tide or if they could come along side the wharf, they would parbuckle the oil filled drums onto the wharf and roll them up the hill. The picturesque Hampton Lighthouse was originally lit by kerosene when it was built in 1911. The lightkeeper lived in the village and travelled to the light each night to light the lamp inside the little sixth-order lens. The light was changed to electric in the 1940's. Between February and May 1993, the Coast Guard re-shingled the sides and repaired the lantern. 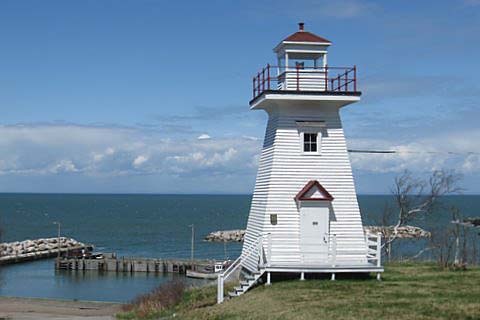 In 2001, the lighthouse became the second in the Maritime Provinces to be passed over to a non-profit community group through the federal government's lighthouse transfer initiative. On Friday November 30, 2001, the lights shone brightly at the Hampton Community Hall, sprightly music played and the tables were decorated with lighthouses. The community was gathered to celebrate the signing of the agreement passing ownership of the Hampton Lighthouse from the Department of Fisheries and Oceans (DFO) to the Hampton Lighthouse Society (Formerly the Tidal View Drive Association.). 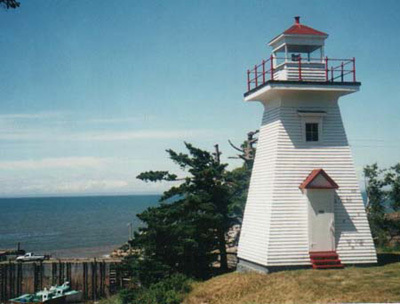 Hampton is the second light in Canada to be passed over for $1.00 under the 96-1 Directive (Cape Forchu, near Yarmouth, was the first. ), and the first to be passed to a community non-profit association. Louise Sanderson and Barb Sancton, who did much of the work to get the light were glowing. Barb presented a special "loonie" ($1.00 coin) to Ed Gibney, who represented the Department of Fisheries and Oceans - the actual loonie given to her at the end of a yard sale to make up the society s first $1000 in fund raising. The original group has evolved in to the Hampton Lighthouse and Historical Society. The group is now responsible for keeping it light lit and for maintenance. In the past few years they have undertaken the painting of the lighthouse from top to bottom and made extensive repairs to the lantern room. 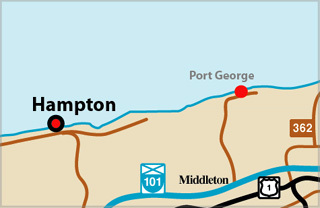 On the Bay of Fundy at Hampton near Bridgetown, it stands on the hill above the fishing harbour of Chute Cove. Light Height: 069ft feet above water level. The first light keeper was Tom Burton. He tended the light for only a short period of time. Herbert Foster took over from Tom. In the 1920's Vernon Dunn took over from Herbert. Claude Hamilton from Vernon in 1950's. Government changed in 1957 so Frank Cropley got the keeper's job from Claude but by this time the lighthouses were being automated, so Frank got very little pay, a short time after the light keeper was replaced by the Department of Transport, whose men came every month or so to check on the light house.